27/09/13 -- Brazilian Crop Weather: "Rainfall has begun to increase in South Brazil, improving field moisture for corn planting. Last week, scattered showers brought 0.75 to 1.5 inch of rainfall to south-eastern South America. Parana and Rio Grande do Sul, key corn states, received a good soaking rain along with eastern Argentina and Uruguay. These were the first good rains of the spring season. Central Brazil has been very hot and dry in September. However the new forecast is hopeful for rain. A trough of low pressure would bring instability to the region stalling in central Brazil for a while and causing recurring showers. The GFS model predicts at least one inch of rainfall but locally more in Central Brazil. Rain is needed to accelerate corn planting in southern and central Brazil. Soybeans are sown later, mostly in October and November. Brazil’s leading soybean state Mato Grosso has been extremely hot and dry, as producers wait for the rainy season to begin. September temperatures have frequently exceeded 95 F, even reaching 100 F with a lack of rainfall in recent weeks. The monsoon typically strengthens in October, improving field moisture and permitting soybean planting to move forward in Brazil's top soybean state. As showers increase, the temperatures begin to moderate. Mato Grosso soybean planting last season was delayed by a slow-developing monsoon. Most soybeans were planted after October 25. The delayed planting did not have a negative bearing on soybean production though, as the Brazilian harvest made a record," said Martell Crop Projections. Soycomplex: Nearby beans closed with small gains on the day and for the week. Any pre-USDA report positioning seems to be done, as the trade awaits Monday's stocks numbers for guidance on where to go next. The USDA's capacity for surprise is of course legendary, will they spring another one on Monday? They did last year, and corn closed limit up, wheat up 40-50 cents and beans dragged 30 cents firmer despite a bigger stocks number than anticipated for the latter. The trade average guess for old crop soybean ending stocks on Monday is 124 million bushels. With Monday also being month end an quarter end things could get choppy. Yesterday's large weekly export sales means that the US already has 69% of the USDA forecast for the full season on the books, and either shipped of waiting to go versus the 5-year average of 46.9%. A report on Reuters suggests that Argentine farmers are "hoarding" beans as a hedge against inflation. This isn't the first time that this has been mooted. Argentine growers are said to have sold 68-70% of their 2012/13 soybean crop versus 85% this time a year ago and the 5 year average of 78%. Rains are in the forecast for Argentina which has yet to begin planting the 2013/14 soybean crop. Argentine sunflower planting is only 21.1% complete versus 18.9% a week ago and 28.8% a year ago. China is closed for a week starting Tuesday. Taiwan bought 50 TMT of Brazilian beans for March shipment. Nov 13 Soybeans closed at USD13.19 3/4, up 3 cents; Jan 14 Soybeans closed at USD13.21 1/2, up 2 3/4 cents; Oct 13 Soybean Meal closed at USD419.90, up USD3.50; Oct 13 Soybean Oil closed at 41.51, down 28 points. Nov 13 beans were 4 1/2 cents higher on the week, Oct 13 meal rose USD6.50 and Oct 13 oil fell 58 points versus last Friday. Corn: The corn market settled slightly lower on the day, and marginally higher on the week. Monday's USDA report is expected to show old crop US corn ending stocks of around 680 million bushels, some 20 million higher than the USDA had in the September WASDE report. South Korea's Kocopia bought 55 TMT of optional origin corn for Jan shipment. South Korea's MFG bought 120 TMT of corn split 70 TMT from South America for March shipment and 50 TMT of optional origin for Feb shipment. The Philippines are said to have bought 30 TMT of corn from Thailand this week. You will note that none of these sales are guaranteed US origin, but despite that cumulative US corn sales stand at 44.5% of the USDA forecast for 2013/14 marketing year versus a 5 year average of 38.3%. The Buenos Aires Grains Exchange say that lack of rain means that Argentine corn planting is only 4.6% complete versus 2.8% a week ago. Last year it was 9.6% complete and the 5 year average is 14.6% at this time. They estimate the 2013/14 corn planted area at 3.56 million hectares. China's National Development and Reform Commission (NDRC) announced corn import quotas of 7.2 MMT for 2014. The Russian corn crop is only 13% harvested at 1.5 MMT. Ukraine is also struggling to harvest what it hopes will be a record corn crop due to almost constant rain. The US harvest is ongoing, and better than expected yields keep getting reported. Informa apparently raised their forecast for the US 2013 corn crop by almost 150 million bushels to 13.889 billion bushels. Dec 13 Corn closed at USD4.54, down 2 3/4 cents; Mar 14 Corn closed at USD4.66 1/2, down 3 cents. For the week that puts Dec 13 up 3 cents and Mar 14 up 2 3/4 cents. Wheat: Wheat closed higher for the fifth straight session on a combination of short-covering and positioning ahead of Monday's stocks and production numbers. The average trade guess for Sep 1 US wheat stocks is 1.913 billion bushels, but the range is wide at 1.819 to 1.999 billion, so there's plenty of scope for either a bullish or bearish surprise to be sprung there. The USDA will also report on 2013/14 US wheat production, with the average trade guess at 2.108 billion bushels, from within a range of estimates of 2.016 to 2.137 billion and the USDA's previous estimate of 2.114 billion. Talk of Chinese buying interest, strong demand from Brazil and possible crop damage in Argentina have spooked a few shorts this week. We've also seen continued strong global demand and now there's talk of acute planting delays in winter wheat in Russia and Ukraine. The USDA today announced the sale of 121,600 MT of US wheat sold to unknown for 2013/14 delivery. The sale included 55,000 MT of hard red winter wheat, 38,800 MT of soft white wheat and 27,800 MT of hard red spring wheat. China's NDRC put 2014 wheat import quotas at 9.6 MMT. The Buenos Aires Grains Exchange said that 22% of the Argentine wheat area is in fair to poor condition. The Ukraine Farmers Association estimated Ukraine’s winter grains are only 20-25% planted due to heavy rains. The Ukraine Ag Ministry said that winter grains had only been planted on 1.987 million hectares (including 1.8 million of wheat) versus 4.525 million (including 4.1 million of wheat) this time a year ago. Dec 13 CBOT Wheat closed at USD6.83, up 4 3/4 cents; Dec 13 KCBT Wheat closed at USD7.31 3/4, up 4 1/2 cents; Dec 13 MGEX Wheat closed at USD7.31 1/2, up 7 cents. Chicago wheat was up 36 3/4 cents on the week, with Kansas up 35 cents and Minneapolis gaining 31 3/4 cents. 27/09/13 -- EU grains closed mostly higher, encouraged by Chicago wheat rising to a two month high on the Dec 13 contract, and the best levels for a front month since June. The market closed with Nov 13 London wheat settling GBP0.25/tonne firmer at EUR156.00/tonne and Jan 14 up GBP0.15/tonne at GBP158.05/tonne. Nov 13 Paris milling wheat rose EUR2.25/tonne to EUR193.50/tonne whilst Nov 13 Paris rapeseed was up EUR3.00/tonne higher at EUR367.25tonne. Nov 13 Paris wheat settled on the highs of the day, and the best close in more than two months as EU exports continue at a brisk pace. Brussels issued 436 TMT of soft wheat export licences this past week, taking the 2013/14 marketing year to date total to an impressive 6.2 MMT. This time a year ago that total was only 3.3 MMT and we finished up exporting 22.2 MMT of wheat in 2012/13, according to the USDA. We would therefore appear to be well ahead of schedule to hit this season's target of 23 MMT. For the week, Nov 13 London wheat settled GBP4.30/tonne higher, with it's Paris counterpart up EUR7.75/tonne. Front month rapeseed gained EUR4.25/tonne. The Russian rain-lashed grain harvest lumbers on at a painfully slow pace. Progress is currently less than 75% done, producing a crop of 76 MMT to date. That includes 47.2 MMT of wheat off 77.1% of the planned area, along with 14.6 MMT of barley off 81.1% of plan. This also means that planting of winter crops for the 2014 harvest is well behind schedule. Less than half of the planned winter cropped area has been sown so far - 7.4 million hectares. This time last year planting had been completed on 11 million hectares. The official forecast for winter grains plantings this year is 16.4 million hectares. It's a similar story in Ukraine where constant rains mean that possibly around 2 million of the planned 7 million hectares of winter wheat might not get sown this year, according to the Ukraine Farmers Association. The first frosts of the winter are forecast for northern Ukraine and around Moscow next week, say Agritel. It's looking like there could be more spring wheat sown in these areas than normal for next season's harvest - if they can get the seed. As wheat prices in the States currently outrun corn levels by a traditionally high premium of more than USD2/bushel the incentive to plant more of the former for 2014 is high. Back in the spring when this year's corn crop was getting planted, wheat and corn prices in the US were almost at parity. Hence US farmers sowed the largest corn area in 75 years. Here in Europe the price difference between wheat and corn was only around 10-12 euros in the spring, today it's closer to 25 euros. The IGC forecast world wheat plantings for the 2014 harvest at 225.4 million hectares, the highest since 1997. The IGC yesterday cut their forecast for the EU-28 corn crop this year from 65.7 MMT to 64.2 MMT, even so that's still up 14% on last year. 26/09/13 -- Soycomplex: Beans closed lower on fund selling/repositioning ahead of Monday's USDA stocks report. Weekly export sales for beans were robust at 2.8 MMT, with China accounting for 2.3 MT of that total. Around 2 MMT of that was already reported business from last week though. That takes cumulative sales for 2013/14 to 69% of the USDA target for the season already. The Chinese government sold around half of the 500 TMT of soybeans that they offered at auction today. Cargill are said to be temporarily shutting down two crushing plants - one in Kansas City and one in Wichita due to a lack of beans following the slow to get going harvest. 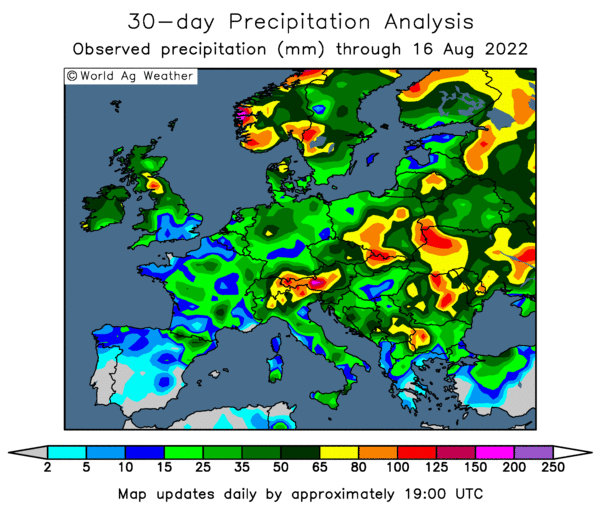 Constant rains are leading to production and quality downgrades for soybean and sunseed crops in Russia and Ukraine. The weak Brazilian real means that the cost of producing soybeans in Mato Grosso state is 27% higher this year than it was 12 months ago, says Dr Michael Cordonnier. Rain is in forecast for parts of South America starting Sunday. Soybean planting is on hold for now until they arrive. China are said to have crushed 45 MMT of soybeans this calendar year so far (to Sep 20), up 6.3% on a year ago. Nov 13 Soybeans closed at USD13.16 3/4, down 5 cents; Jan 14 Soybeans closed at USD13.18 3/4, down 5 1/4 cents; Oct 13 Soybean Meal closed at USD416.40, down USD2.20; Oct 13 Soybean Oil closed at 41.79, down 3 points. Corn: The corn market was marginally higher in light short-covering ahead of Monday's stocks report. Weekly export sales were 640,100 MT, which was at the top end of trade expectations of 400-700 TMT. The IGC cut their forecast for the world corn crop by 2 MMT to 943 MMT - still comfortably a record crop though. Ukraine's crop was raised to 28 MMT and China's cut to 210 MMT. They said that Chinese corn imports will be lower than forecast last month due to substitution of sorghum into feed rations. CNGOIC estimated China’s 2013/14 corn imports at 5.5 MMT versus 3.0 MMT last year, although 1.5 MMT less than the USDA currently predict. COFCO estimated China’s 2013/14 DDGS imports at 3.0 MMT and estimated China’s 2013/14 sorghum imports at 1.5 MMT. The Ukraine PM said that the country's corn exports would rise from 14 MMT in 2012/13 to 18 MMT in 2013/14. Their corn harvest is ongoing but making slow progress under heavy rains. The nation's total grain harvest is said to be 71% complete at 36 MMT. The PM said that total grain production could reach 60 MMT this year, up 30% versus 46.2 MMT a year ago. The Ukraine Ag Ministry estimated the nation's late grains harvest (mostly corn) at 28 MMT. The Russian corn area is almost 13% harvested, producing 1.5 MMT to date. South Korea's Nofi bought 55 TMT of optional origin feed wheat for December delivery in preference to corn. Early US corn yields continue to come in better than expected. Dec 13 Corn closed at USD4.56 3/4, up 2 cents; Mar 14 Corn closed at USD4.69 1/2, up 2 1/4 cents. Wheat: Wheat was higher for the fourth session in a row on continued short-covering ahead of Monday's stocks report. The USDA will also report on US wheat production on Monday. The IGC raised their world wheat crop forecast for 2013/14 by 2 MMT to 693 MMT and cut consumption by 1 MMT to 687 MMT. Ending stocks were increased 4 MMT to 180 MMT. In Brazil's Parana state the local Ag Ministry estimated their 2013/14 wheat crop at 1.7 MMT and said that harvesting was 25% complete. There's continued talk that Brazil is shopping for US wheat. Weekly export sales came in at 620,200 MT versus the 550-850 TMT expected. China (171,400 MT) was the top buyer. Brazil took 74,800 MT. There's also talk of further Chinese interest in US hard red spring wheat and/or Canadian and Australian wheat. Argentine farmers played down the damage potential from frost earlier in the week. The Saskatchewan crop harvest is 71% complete versus 60% on average at this time, average to above average yields are being seen. Rusagrotrans said that Russia's 2013/14 wheat ending stocks would rise from 8.9 MMT in 2012/13 to 11.7 MMT, including 3.0-3.5 MMT of intervention stocks. The Russian government are expected to begin buying for their depleted intervention fund in a fortnight. Morocco are tendering for 175 TMT of wheat on the local market. They are also looking for 373 TMT of US and 400 TMT of EU soft wheat. Algeria's grain crop is now only seen at 4.2 MMT versus last year's production of 5.1 MMT, spurring increased imports. Dec 13 CBOT Wheat closed at USD6.78 1/4, up 7 3/4 cents; Dec 13 KCBT Wheat closed at USD7.27, up 9 cents; Dec 13 MGEX Wheat closed at USD7.24 1/2, up 6 1/4 cents. 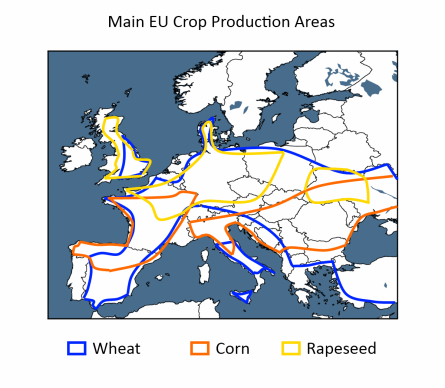 26/09/13 -- EU grains closed mixed, media reports suggest that yesterday's sharp rises based on possible Argentine frost damage may have been a knee jerk reaction. Nov 13 London wheat settled GBP0.15/tonne easier at GBP156.00/tonne, whilst Jan 14 was GBP0.25/tonne lower at GBP158.05/tonne. Nov 13 Paris milling wheat rose EUR0.50/tonne to close at EUR191.25/tonne. Nov 13 Paris rapeseed was down EUR0.75/tonne at EUR364.25/tonne. 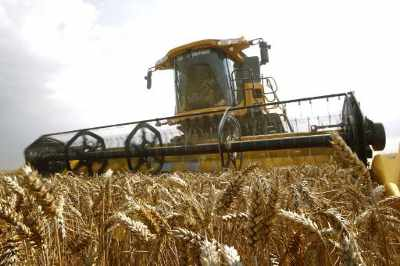 The NFU said that English wheat yields came in at 7.8 MT/ha this year, marginally above the 5-year average of 7.7 MT/ha, and 16% up on last year's disappointing 6.7 MT/ha. Due to autumn wetness that lingered into the early spring they have the English area at only 1.51 million ha. That suggests a UK crop of around 12.5 MMT, when we add in Scotland and NI/Wales. Defra will report on that early next month. Ukraine and Russia continue to have problems with too much rain. My agronomist chum in Ukraine, Mike Lee, sent me a tweet today to say "it's wetter than an otter's pocket over here at the moment, I wouldn't be so confident about getting all that corn into the shed." Agritel report that September rainfall in Ukraine was 150-400% of normal. Yet the Ukraine Ministry remain bullish on crop production prospects. Their PM says that they expect a grain harvest of 60 MMT versus 46.2 MMT a year ago. Their Ag Ministry say that the early grain harvest (excluding corn) is 33 MMT, and the late grain harvest will total 28 MMT. They've currently harvested 36 MMT of grains off 71% of the planned area. Local analysts APK Inform have downgraded their Ukraine sunseed production estimate from 9.8 MMT to 9.0 MMT. The USDA currently say 11.5 MMT. Similar problems exist in Russia. Their grain harvest now stands at 75.5 MMT off 74.1% of plan. Wheat accounts for 46.9 MMT of that off 76.2% of plan. Rusagrotrans estimate the total grain harvest this year at 89.0-89.7 MMT versus 75.2 MMT last year. SovEcon today said that they expect that Russia's wheat exports of 3.5 MMT in August will be their highest monthly total of the season, and that they will tail off from hereon in. They peg full season Russian wheat exports at 14.5 MMT versus 17.0 MMT from the USDA. The Kazakh Ministry said that they expect this season's wheat (including flour) exports to be around 9.5-9.8 MMT. Morocco are tendering to buy 175 TMT of wheat on the local market. Their 2013 domestic wheat crop almost doubled this year, meaning that their imports will halve to around 2 MMT in 2013/14, according to the USDA's FAS office. The Australian wheat harvest is now underway, adding further supply to the global market. 25/09/13 -- Soycomplex: Beans closed higher in what looks like positioning ahead of Monday's quarterly stocks report from the USDA, also garnering support from a sharply higher wheat market. The USDA announced the sale of 140 TMT of US beans sold to unknown for 2013/14 delivery. Sales commitments for the new season are already well ahead of schedule. Tomorrow's weekly export sales are expected to be around 2.5-2.8 MMT, given that they will include last week's large 1.93 MMT sale to China. Yet sales already only need to be 285 TMT to reach the USDA's target for the 2013/14 season. On Monday the USDA will report on US soybean stocks as at the end of 2012/13. The average trade guess for these is 124 million bushels, from within a range of estimates of 106-155 million and 169 million a year ago. The USDA have steadfastly stuck by their figure of 125 million for some time, so there is perhaps little reason to expect them to change now. These are the lowest in 9 years and the second tightest since 1977. South America waits for rain before planting gets going in earnest. Rain is in the forecast for southern Brazil, but Mato Grosso remains dry and also hot, with temperatures topping 100 F. Bizarrely there's frost in the forecast for Argentina. Lanworth today raised their world soybean production estimate in 2013/14 from 281 MMT to a new record 284 MMT and versus the USDA's current 281.66 MMT. They see production in Brazil and Argentina both at record levels. In Brazil they go for 88.3 MMT, up 7.7% on 2012/13. In Argentina they see the crop at 56.9 MMT, up 15.2% versus 2012/13. Both estimates are higher than the current forecasts from the USDA - 88.0 MMT and 53.5 MMT respectively - the latter considerably so. The Argentine Ag Minister would only say that he saw production there at "above 50 MMT" in 2013/14. Record canola yields are being seen in Saskatchewan, prompting some analysts to say that Canada’s 2013 canola crop could be as much as 17.0 MMT versus the USDA's current estimate of 15.15 MMT and 13.87 MMT last year. Nov 13 Soybeans closed at USD13.21 3/4, up 9 1/4 cents; Jan 14 Soybeans closed at USD13.24, up 9 1/4 cents; Oct 13 Soybean Meal closed at USD418.60, up USD4.50; Oct 13 Soybean Oil closed at 41.82, down 2 points. Corn: The corn market was dragged higher by wheat, there may also have been some short-covering ahead of Monday's quarterly stocks report from the USDA after prices dipped to their lowest levels for a front month in 3 years this week. USD4.50/bushel seems to be a pivotal level. The trade is expecting the USDA to peg US 2012/13 corn ending stocks at around 680 million bushels on Monday, from within a range of estimates of 552-750 million and versus 989 million a year previously. These would be a 17 year low and the second tightest since 1976. There's a school of thought that the report could contain a bullish surprise for corn. Firstly, there wasn't much new crop corn around on September 1 to potentially swell these stocks, unlike last year. Secondly, some suggest that US corn for feed usage in the Q4 of 2012/13 may have been greater than the trade generally thinks. This could make the carryover into 2013/14 even smaller. Time will tell. Lanworth are bullish on production prospects for 2013/14, predicting a global corn crop of 949 MMT, up 7 MMT from their previous forecast, although below the USDA's current estimate of 956.67 MMT. "World corn production will easily exceed the 2011/12 record. World ending stocks could be among the highest since 2001/02," they said. They have corn production in Brazil at 75.9 MMT and in Argentina at 28.2 MMT, versus 72 MMT and 26 MMT respectively from the USDA. The Argentine Ag Minister said that his country's corn crop would be "at least" 30 MMT this year. Corn harvesting in Russia and Ukraine is only making slow progress, dogged by heavy rain. There's talk of some production and quality downgrades there. There's talk that private Chinese importers are seeking new crop US corn for Jan shipment. The US weather is beneficial for harvesting over the next two weeks, as rain is limited. There are no damaging cold temperatures in the forecast, most states are now said to be past the risk of yield loss. Better than expected continues to be the recurring theme on yields so far. Trade forecasts for tomorrow's weekly export sales are 400-700 TMT. Sales of 354 TMT are all that is needed to match USDA targets. Weekly US ethanol production fell 6,000 barrels/day to 832,000 bpd. Dec 13 Corn closed at USD4.54 3/4, up 6 cents; Mar 14 Corn closed at USD4.67 1/4, up 5 3/4 cents. Wheat: Wheat rose on short-covering as the trade got all excited over talk of frost in Argentina. The idea is that any trouble with Argentina's crop could keep Brazil in the import market a while longer yet. They have been active buyers of US wheat over the past 6-8 weeks, although there's talk that they have been buying Canadian and Polish wheat in the past week. There's talk that Brazil was seeking US HRW wheat for Nov/Dec shipment yesterday. The trade is also thinking that China will soon be back in the market for wheat, and that US origin is well placed to service that need. Reuters today reported that domestic Chinese wheat prices are at all-time highs, which could stimulate imports further. The size of the fund short in CBOT wheat - 87,420 contracts as of last Friday's COT report - is approaching record levels which leaves the market vulnerable to an upside correction. We also have the fact that seasonally CBOT wheat rallies at this time of year once the northern hemisphere harvest is more or less done. Lanworth left their 2013/14 world wheat production forecast unchanged at 704 MMT - a record although not as high as the USDA's forecast of almost 709 MMT. Russia is making slow progress with it's wheat harvest, which is only around 75% complete so far at 46.3 MMT. Bangladesh cancelled a tender for 50 TMT of optional origin wheat for Oct/Nov shipment due to high prices. India are looking to sell wheat but their price ideas are too high. They are likely sell into any rallies though, capping upside potential, although they are not everybody's favoured supplier. Canadian wheat production is expected to be bumper this year, although protein levels are down at 12.4-13.1% in spring wheat as opposed to 13.1-14.2% last year. For Monday's report the USDA is expected to give us Sep 1 US wheat stocks of 1.913 billion bushels, from within a range of estimates of 1.819-1.999 billion and 2.269 billion a year ago. They will also report on US wheat production, with an average guess for all wheat at 2.108 billion bushels versus 2.114 billion in August and 2.269 billion last year. Trade estimates for tomorrow's weekly export sales report are 550-850 TMT. Sales of only 344 TMT are required to hit the USDA target for the season. Dec 13 CBOT Wheat closed at USD6.70 1/2, up 12 1/4 cents; Dec 13 KCBT Wheat closed at USD7.18, up 13 1/4 cents; Dec 13 MGEX Wheat closed at USD7.18 1/4, up 13 1/4 cents. 25/09/13 -- EU grains closed higher across the board with Nov 13 London wheat settling GBP2.85/tonne firmer at EUR155.85/tonne and Jan 14 GBP3.15/tonne higher at GBP158.30/tonne. Nov 13 Paris milling wheat was up EUR3.25/tonne to EUR190.75/tonne whilst Nov 13 Paris rapeseed rose EUR2.50/tonne to EUR365.00/tonne. Chicago wheat firmed on short-covering following reports that Argentina's crop (currently at the heading stage) was at risk from sub-zero temperatures overnight, with more of the same forecast for the weekend. That was the catalyst to take EU wheat higher with it. 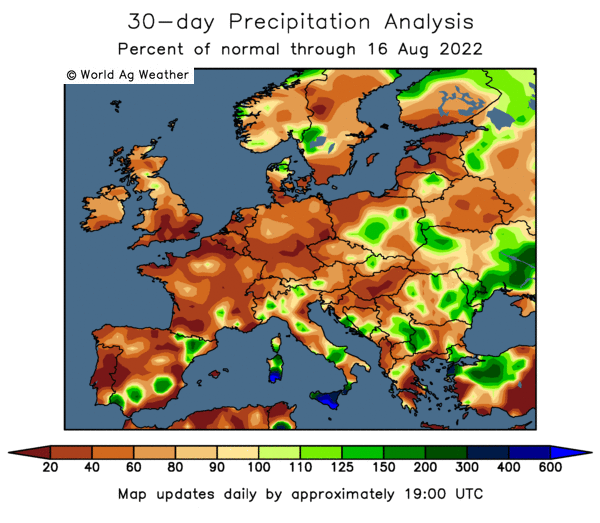 Incessant rains also continue to disrupt the Russian and Ukraine grain harvests, and also the winter planting campaign. Russia's grain harvest is less than three quarters done at 73% complete, producing 74.7 MT so far. The wheat harvest accounts for 46.3 MMT of that off 75% of plan, with yields coming in at 2.46 MT/ha versus 1.86 MT/ha last year. The Russian corn crop is less than 13% harvested. Ukraine's corn crop also faces production and quality downgrades as it struggles to get harvested. The rain and delayed harvest meanwhile means that Russian and Ukraine growers are also challenged to get their winter crops sown before the weather bites. Russia has only sown around 7 million hectares of winter grains, down 1.77 million on this time last year, a figure that only represents 42.8% of the planned area. Domestic Chinese wheat prices are at record highs, according to Reuters. That is fostering the notion that they will soon be back in the market again for wheat, some reports suggest that they are currently actively seeking US/Canadian/Australian wheat to add to their existing purchases for 2013/14. One Chinese analyst said that the government may soon begin auctioning off state-owned wheat reserves in an effort to curtail rising prices. 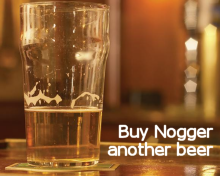 That could also stimulate some import interest. Some of this news isn't particularly new today, but with fund money holding a hefty wheat and corn short position in Chicago, and a USDA quarterly stocks and wheat production estimate coming out on Monday, it's enough to trigger some short-covering. The possible downgrade to Argentina's 2013/14 wheat crop wouldn't be such an issue if it wasn't for the fact that Brazil has been such an active importer of late. Their own crop is already known to have been badly damaged by frost, and they are South America's largest wheat buyer. What they can't buy from Argentina they will be forced to look outside the Mercosur trade bloc to purchase. They are supposed to have bought 1-2 cargoes of Canadian wheat and 2 cargoes of wheat from Poland in recent days, according to trade gossip. Meanwhile EU wheat exports continue unabated. Germany exported 651 TMT of wheat in July, the first month of the new marketing year, up 79% versus July 2012, according to customs data out today. French exports were also higher in July at 961 TMT. Potential quality issues with Russian wheat will likely push more interest the way of France and Germany later in the season. APK Inform report that Ukraine was the top supplier of wheat to the EU in 2012/13, being responsible for 28% of our imports. The US was second at 19% and Canada third at 14%, they say. 24/09/13 -- US Crop Weather: "One inch of rainfall occurred in the Midwest last week, the highest weekly amount since late June. Rainfall is much to late to rescue soybeans and corn from a depressed yield. The generous rain gave corn a boost as US corn conditions improved to 55% good-excellent, 29% fair and 16% poor-very poor. US soybeans remained stable with 50% good-excellent, 33% fair and 17% poor-very poor. Corn development has advanced in September with above normal temperatures (4 F above average). The warmth has extended the growing, pushing US corn maturity to 40%. Producers in the northern Midwest are happy for the warmth, particularly in Iowa and Minnesota. Corn was planted very late in slow-developing spring, needing extra heat units to bring the crop to safe maturity. Iowa corn was only 35% ripe on September 22 representing a 10-12 day delay in maturity. Minnesota corn was only 17% mature. Warm temperatures are expected to prevail for another week at least, ideal for late-maturity crops. Generous rainfall last week may be too late for soybeans to reap yield benefits. It takes 30-35 days for soybean seeds to fully develop once pods are set. Rain in mid September would help only the latest pod-filling soybeans. Note that 72% of US soybeans were setting pods August 18. 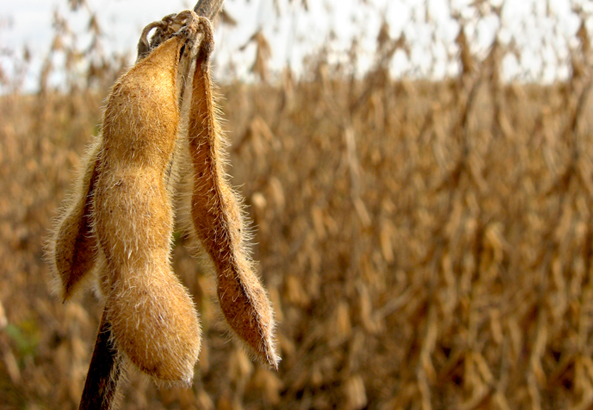 Thus only the last 28% of soybeans still filling pods would benefit from late-September rainfall. Nearly half of soybeans were shedding leaves September 22, indicating early senescence," said Martell Crop Projections. Soycomplex: Beans rebounded from one month lows in modest "Turnaround Tuesday" trade. The fact that the USDA didn't see that last week's rains justified an increased good/excellent crop rating was a disappointment. Media reports suggest that, for the first time ever, Brazil will export more soybeans this year than they will crush. Despite record production in 2012/13 they will in fact have the smallest domestic crush since 2009 this year. The Feb/Jul Brazilian crush was 19.3 MMT, down 7% versus the same period in 2012, according to Abiove. Oil World said that Argentina's Aug soybean exports were 1.75 MMT, almost double the 0.9 MMT shipped out in July and the 0.88 MMT exported in Aug 2012. Unlike last year there are still old crop soybeans left to export in South America it would seem. That's probably due to a combination of bumper 2012/13 production and shipping problems earlier in the year. CNGOIC estimated China’s 2013/14 rapeseed imports at a record high 3.59 MMT, up 54% from a year ago. The Chinese government are to allow crushers to import 200 TMT of Russian rapeseed in 2013/14. The rest will mostly come from Canada and Australia. Dr Cordonnier estimated 2013 US bean yields at 40.5 bu/acre, unchanged from his previous estimate. He also estimated the 2013/14 Brazilian soybean area at 29.0 million, up 1.3 million, or 4.7%, on last year. He forecast the Brazilian crop next year at a record 88 MMT, up 7.3% versus 2012/13. He also estimated the 2013/14 Argentine bean area up one million ha at 20.5 million ha. Their production in 2013/14 will be 55.0 MMT, up 11% versus last year's 49.5 MMT, he said. He estimated the total 2013/14 South American bean crop at a record 158.8 MMT versus 146.4 MMT in 2012/13. Argentine soybean plantings have yet to start. A Buenos Aires Grains Exchange weather analyst said that severe frosts are in the forecast for Argentina over the weekend. Somar said that soybean plantings in the leading Brazilian soybean state of Mato Grosso are only 1% done. There's some talk of a Midwest frost/freeze event for around October 8-9th. Nov 13 Soybeans closed at USD13.12 1/2, up 4 3/4 cents; Jan 14 Soybeans closed at USD13.14 3/4, up 4 1/4 cents; Oct 13 Soybean Meal closed at USD414.10, up USD3.00; Oct 13 Soybean Oil closed at 41.84, down 13 points. Corn: The corn market fell back below USD4.50/bu on front month Dec 13 after the USDA surprisingly raised good/excellent crop ratings for US corn by 2 percentage points to 55%. ProFarmer raised their US 2013 corn production forecast to a record 13.5 billion bushels. Dr Cordonnier estimated 2013 US corn yields at 152.0 bu/acre, unchanged from his previous estimate. He estimated the 2013/14 Brazilian total corn area at 15.0 million ha versus 15.9 million last year. He's got production in 2013/14 at 72.0 MMT, down 11% versus the 2012/13 record crop of 81.0 MMT. Plantings and production are also seen lower in neighbouring Argentina where he has the 2013/14 Argentine corn area at 3.5 million ha versus 3.8 million in 2012/13 and output at 25.0 MMT versus 26.5 MMT in 2012/13. He estimated the total 2013/14 South American corn crop at 100.6 MMT versus 111.6 MMT a year ago. Corn plantings in Argentina are around 3% done, he added. First crop corn planting is underway in Brazil. Rio Grande do Sul is said to be 41% complete versus the 5-year average of 32%. Santa Catarina is 39% complete versus the 5-year average of 34%. Parana is 13% complete versus the 5-year average of 7%. Sao Paulo is 1% complete, in line with the 5-year average. Conab will make their first 2013/14 Brazilian crop production estimates on October 8th. The USDA announced 180 TMT of US corn sold to Colombia for 2013/14 delivery. Harvest pressure and continued reports of better than expected US corn yields weighs on the market. This was the lowest close for a front month in CBOT corn for more than 3 years, yet even so US cash prices are still expensive compared to the competition. "Fob offers as of today showed the US Gulf at a USD16/ton premium to Argentina, a USD26/ton premium to Brazil and a USD28/ton premium to the Ukraine for October. The spread narrows for Nov/Dec, however the other origins still maintain a significant price advantage," said Benson Quinn Commodities. Weekly US ethanol production data will be released tomorrow. Last week's output was 838,000 barrels/day. Dec 13 Corn closed at USD4.48 3/4, down 4 1/2 cents; Mar 14 Corn closed at USD4.61 1/2, down 4 1/2 cents. Wheat: The wheat market managed to shrug off falling corn prices and drag itself higher on short-covering and seasonal factors. Friday's Commitment of Traders report had funds sitting on a near record short position in CBOT wheat. Taiwan bought 92,350 MT of US wheat for Nov/Dec shipment, in a combination of dark northern spring, HRW, and western white wheat. India said that they want to export 2 MMT of wheat, and issued a tender for 160 TMT, although the government's minimum price ideas of USD300/tonne are well above market levels. They may use the bid prices to gauge how much they need to revise their aspirations, although with an election not too far away the government may not want to be seen to be losing too much money on the deal and providing the opposition with some mud to sling their way. Dropping their price by around USD30/tonne to get closer to world market levels loses them a cool USD600 million. Even then they might not get knocked over in the rush. Egypt have been buying wheat at around USD255/tonne lately. Ukraine wheat was said to be the cheapest offer in an Iraqi tender to buy wheat. Bangladesh are also tendering for wheat. Tunisia bought 59 TMT of optional origin durum wheat for Oct/Nov shipment. Russia said that they will start purchasing grain for the intervention fund in the first 10 days of October. They are expected to buy 2-3 MMT by the end of the year. Their grain harvest now stands at 74 MMT off 72.3% of plan, with yields averaging 2.22 MT/ha versus 1.83 MT/ha this time last year. The Ag Ministry are sticking to a production forecast of 88-90 MMT, although that is now starting to look a little low. The Kazkah Ministry have been low with a production estimate of 15 MMT for most of the summer, they now say 18.5 MMT versus 12.8 MMT last year. A hard frost is in the forecast for Argentina over the weekend, which could damage wheat there. Brazil's crop has already been adversely affected by frost this year. Dec 13 CBOT Wheat closed at USD6.58 1/4, up 4 3/4 cents; Dec 13 KCBT Wheat closed at USD7.05, up 7 1/4 cents; Dec 13 MGEX Wheat closed at USD7.05, up 6 1/4 cents. 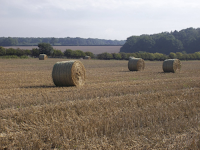 24/09/13 -- EU grains closed mixed but generally higher, with Nov 13 London wheat settling GBP1.00/tonne firmer at EUR153.00/tonne and Jan 14 up GBP0.70/tonne at GBP155.15/tonne. Nov 13 Paris milling wheat rose EUR0.50/tonne to EUR187.50/tonne whilst Nov 13 Paris rapeseed was EUR0.50/tonne higher at EUR362.50tonne. Seasonal indicators point higher on wheat, but a record world corn crop undermines its upside potential. Corn hasn't yet broken out of its downtrend. So sideways trade continues, although giving the impression that the wheat market is bouncing along the bottom. 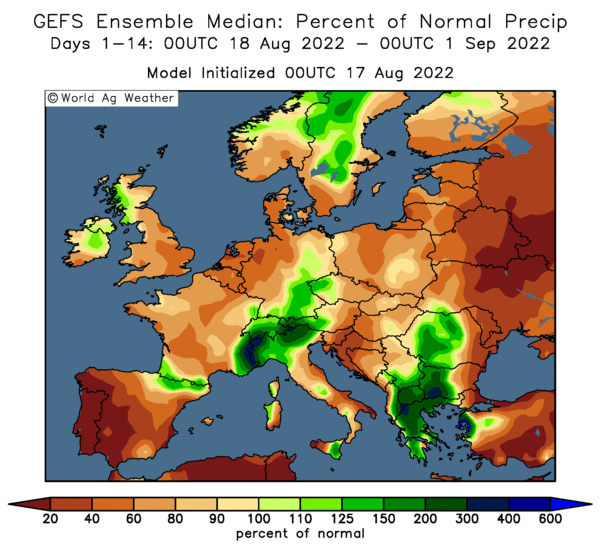 Drier weather is in the forecast for the Black Sea region, which is expected to allow for advancement in winter wheat planting progress and corn harvesting after a prolonged period of rain. Production prospects in Kazakhstan appear to have improved significantly in recent weeks. The Kazakh Ministry now forecast a domestic grain crop of 18.5 MMT, up nearly 45% on last year. They've now harvested 14.56 MMT of grains off 73.6% of the planned area. Yields are up 41.6% at 1.26 MT/ha. The Russian grain harvest is plodding along. Heavy rains in Siberia are disrupting progress, but yields are doing well, similarly to neighbouring Kazakhstan. The Russian wheat harvest now stands at 45.9 MMT off 73.9% of plan, with yields up by a third on last year at 2.47 MT/ha. The Russian Ag Ministry have this year's grain harvest at 88-90 MMT, up around 23-25% on last year. The Russian Ministry also say that they will begin buying for the state intervention fund in early October. They are expected to purchase 2-3 MMT of grains by the end of the year, and 5-6 MMT in the whole of 2013/14. They've exported 1.855 MMT of grains this month so far, to Sep 18, including 1.6 MMT of wheat, 179 TMT of barley and 59 TMT of corn. That brings the total 2013/14 marketing year exports to 7.87 MMT, up 14.2% versus 12 months ago, and around half of the full 2012/13 season total less than three months into the campaign. Ukraine's grain harvest meanwhile now stands at over 35 MMT off 71% of plan, as the corn harvest progresses. The Ag Ministry have this year's harvest at 53-54 MMT, up around 15-17% on last year. Ukraine's Ag Ministry estimated Ukraine’s September grain exports at 2.5-2.6 MMT versus 2.46 MMT in August. They estimated Ukraine’s 2013/14 grain exports at 26-30 MMT versus 23.0 MMT in 2012/13. Volume in the FSU clearly isn't going to be a problem this year, even if quality might be. Volume is also well up closer to home in Spain. The Spanish Ag Ministry say that they've harvested 6.4 MMT of soft wheat this year, up from a previous estimate of 6.0 MMT and 36% higher than last year. Tunisia bought 59 TMT of optional origin durum wheat for Oct–Nov shipment in a tender. 23/09/13 -- Soycomplex: Beans and meal closed lower for the third session in a row on further unwinding of spreads and ideas that last week's rains will have improved US crop conditions. Friday's Commitment of Traders report showed that as of September 17th Non-Commercial traders were sitting on a net long 157,211 contracts, an increase of 4,878 contracts on the week, and a fairly hefty long heading into harvest time. Weekly soybean export inspections came in at 16.793 million bushels, up sharply on 2.972 million the previous week, and seem to indicate that new crop beans are finally getting into the export pipeline. Current market year to date exports are now 21.611 million bushels versus 35.194 million a year ago, but there's plenty of time to catch up. Inspections need to average 27.3 million/week to reach the USDA’s forecast for the 2013/14 season. Chinese customs data shows that China imported 6,367,030 MT of soybeans in August, up 44.12% from a year ago Of that total the lion's share (5.11 MMT) came from Brazil, up 82.2% from a year ago. Argentina accounted for 831,634 MT, up 9.5% from a year ago. The US shipped China only 1,390 MT, down 99.65% from a year ago. For the Jan/Aug 2013 calendar year to date China has imported just over 41 MMT of soybeans, up 4.37% from a year ago They've imported 23.897 MMT from Brazil, up 20.15% from a year ago, along with 3.01 MMT coming from Argentina, down 3.79% from a year ago and 12.52 MMT from the US, down 18.62% from a year ago. After the close the USDA left good/excellent soybean crop conditions unchanged at 50%, contrary to the expected 1-2 percentage point increase, although much better than 35% a year ago. Crop development continues to lag. The USDA report showed 47% of the crop dropping leaves, versus the 5 year average of 56%. The crop is 3% harvested, they added, in line with expectations. Funds were net sellers of an estimated 2,000 soybean contracts on the day. Nov 13 Soybeans closed at USD13.07 3/4, down 7 1/2 cents; Jan 14 Soybeans closed at USD13.10 1/2, down 7 1/2 cents; Oct 13 Soybean Meal closed at USD411.10, down USD2.30; Oct 13 Soybean Oil closed at 41.97, down 12 points. Corn: The corn market managed to close a little higher, although trading was confined to a narrow range. Dec 13 fell below USD4.50/bu at one stage, but managed to finish above that level at the close, although the daily trading range was less than 7 cents. Unwinding of long beans/short corn positions may have been a feature. There might also have been some profit-taking triggered at USD4.50/bu. Friday's Commitment of Traders report showed that, as of September 17th, Non-Commercial traders were net short 62,354 contracts, an increase of 34,656 contracts for the week. The USDA announced the sale of 197,200 MT of US corn to Mexico for 2013/14 delivery. South Korea bought 68 TMT of optional origin corn for Feb shipment. Chinese customs data shows that they imported only 10,638 MT of corn in August, down 98.23% from a year ago. That takes the calendar year to date total for Chinese corn imported to only 1,605,313 MT, down 56.92% from a year ago. The Russian corn crop is 10.5% harvested at 1.2 MMT, according to the Ag Ministry there. Weekly corn export inspections came in at 17.916 million bushels versus 20.118 million the previous week. That takes the 20131/4 marketing year to date total to 46.270 million bushels versus 62.466 million this time last year. After the close the USDA raised their corn good/excellent ratings by 2 percentage points from last week to 55%. That's well ahead of only 24% this time last year. They said that 91% of the crop was dented, up 10% from a week ago, and 40% is now mature versus 22% a week earlier but well behind 86% a year ago. The crop is 7% harvested versus 16% for the 5-year average and 4% a week ago. The US weather forecast for the week ahead is dry, conducive for good harvest progress to be made. Dec 13 Corn closed at USD4.53 1/4, up 2 1/4 cents; Mar 14 Corn closed at USD4.66, up 2 1/4 cents. Wheat: Wheat was mixed, 1 cent lower to around 7 cents higher. Short-covering may have been a feature in Chicago where the Commitments of Traders report, as of September 17th, shows Non-Commercial traders were net short 52,798 contracts, an increase of 3,644 contracts for the week. Seasonal factors point higher in wheat. China's CNGOIC estimated the country's 2013/14 wheat imports at 7.5 MMT, up 1 MMT on their previous forecast but 2 MMT lower than the USDA. It is thought that Chinese buying already exists for around 3.7 MMT from the US, 2.2 MMT from Australia, 295 TMT from Canada and 220 TMT from France. That would leave them with only around 1 MMT still to buy. Argentine wheat areas are still dry. Their crop is getting smaller and there's some talk that the very low levels of carryover from 2012/13, and potentially a wheat crop of less than 10 MMT this year, will mean some form of export restrictions again on wheat out of Argentina in 2013/14. That could leave Brazil having to keep open the duty free import window on wheat longer than planned, presenting US wheat with an opportunity. They'd have to compete with EU, Canadian and Australian wheat for the business though. 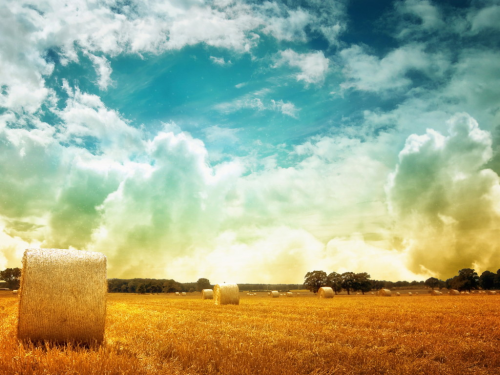 Canada are expected to have their best wheat crop in 20 years due to ideal weather. ABARES have Australia's wheat crop 11% higher this year, and production in the EU is also on the increase. After the close the USDA said that this year's US spring wheat crop is 93% harvested, in line with the 5-year average. They have winter wheat planting at 23% done versus 24% normally. Weekly export inspections came in at 42.319 million bushels versus 46.464 million the previous week. The 2013/14 marketing year to date total is now 462.8 million versus 331.26 million a year ago. Dec 13 CBOT Wheat closed at USD6.53 1/2, up 7 1/4 cents; Dec 13 KCBT Wheat closed at USD6.97 3/4, up 5 cents; Dec 13 MGEX Wheat closed at USD6.98 3/4, down 1 cent. 23/09/13 -- EU grains closed mixed, but mostly a little firmer in more sideways trade. Nov 13 Paris wheat hasn't been more than EUR1.50/tonne higher or lower at the close of any session this month, and today was no exception. Nov 13 London wheat settled GBP0.30/tonne firmer at GBP152.00/tonne, whilst Jan 14 was GBP0.45/tonne higher at GBP154.45/tonne. Nov 13 Paris milling wheat rose EUR1.25/tonne to close at EUR187.00/tonne. Nov 13 Paris rapeseed was down EUR1.00/tonne EUR362.00/tonne. Chicago wheat is trying to follow the seasonal trend higher, Friday's Dec 13 CBOT close was the highest for a front month on the weekly chart in 7 weeks. Falling corn prices however are a limiting factor. Paris wheat remains supported by the strong early pace of EU exports in 2013/14, and ideas that some of the cheaper Eastern European and FSU countries might run short of quality wheat by the new year. Russia is one such country with quality issues, although they may well end up harvesting more wheat in total than the current USDA forecast of 54 MMT. Their harvest stood at 45.2 MMT off 71.8% of the crop area as of Friday. Yields to date are averaging 2.51 MT/ha, up 35% on a year ago and are now actually a little higher than they were at this point in 2011 when final production came in at 56.2 MMT. 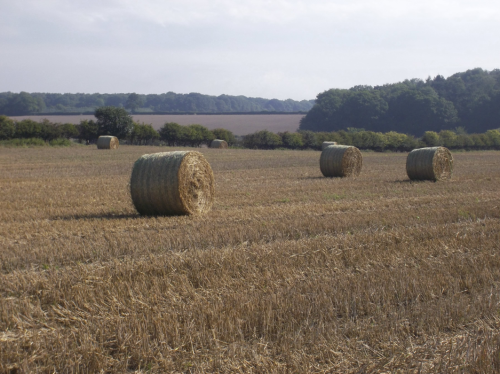 They've also harvested 14.2 MMT of barley off 78.5% of the cropped area, along with 1.2 MMT of corn (off 10.5%) and 1.7 MMT of sunflower seed (off 11.1%). Too much rain has been Russia's problem. Rain makes grain they say however, even if it's sometimes responsible for low quality. The same seems to be true in Kazakhstan where the Ag Ministry have stuck by a grain production forecast of only 15 MMT all summer. That was apparently nudged up to 16.3 MMT a week or so ago, although official confirmation of that seems to have passed me by. They've now revised that estimate up to 18.5 MMT with the harvest currently standing at 14 MMT off 71% of the planned cropped area. The Kazakh Ministry have also raised their export estimate from 7-8 MMT all summer to 9 MMT and now 9.5 MMT. Ukraine say that they've exported 5.27 MMT of grains so far this season, a 14.4% rise on a year ago. Wheat accounts for 3.1 MMT of that, along with 1.6 MMT of barley and 0.6 MT of corn. The mothballed UK bioethanol refinery Ensus is expected to be back in production soon, according to a report on Agrimoney.com. There's plenty of old crop/imported wheat to use, Defra today estimated 2012/13 UK wheat ending stocks at 2.19 MMT, a 46% rise on the previous season. Wheat harvesting is imminent in the southern hemisphere. There are stories that Brazil's Parana state lost a third of its wheat crop, almost 1 MMT, to heavy rains in May followed by a series of frosts in the Jul/Aug period. The Argentine crop is shrinking for a second year due to dryness. Australia's crop however is looking good following life saving rains in August and September. ABARES forecast the wheat crop there at 24.467 MMT, up 11% on last year. The Australian barley crop is seen 13% higher at 7.673 MMT.